There’s still time to get organized for 2018! 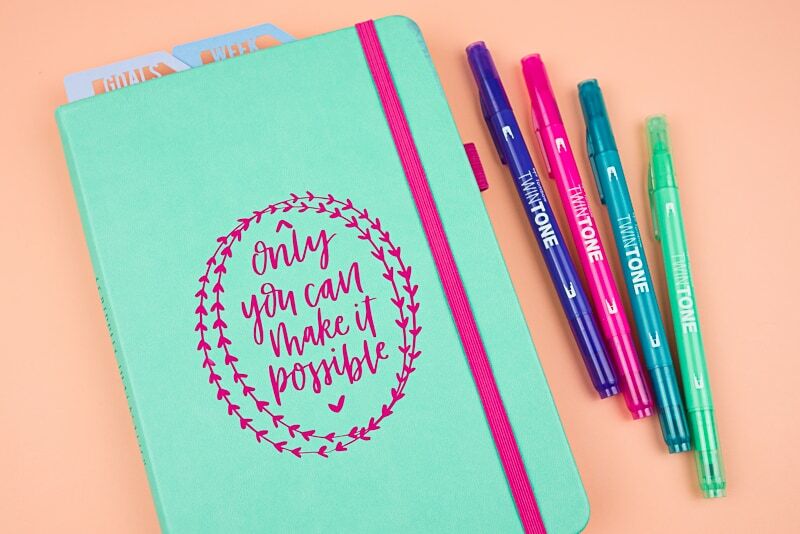 Check out my 2018 journal flip-through and whip your pages into goal-getting shape! Whew! That went fast, didn’t it? It seems like only a couple of weeks ago I was sharing my 2017 journal setup with you, but here we are in 2018. If you followed my Planvember series, many pages of my 2018 journal will look familiar to you. If you missed it, you can catch up on all the planning fun here. One thing I’ve learned since I started keeping a journal instead of a printed planner is that early planning makes all the difference. So, let’s dive right in, shall we? I’m using a Scribbles That Matter Pro notebook this year. I usually favor Leuchtturm1917 or Rhodia (especially because I can order those from my favorite journal shop, JB Welly), but I decided to try a new brand for giggles. So far, I’m very happy with the quality of the Scribbles that Matter. 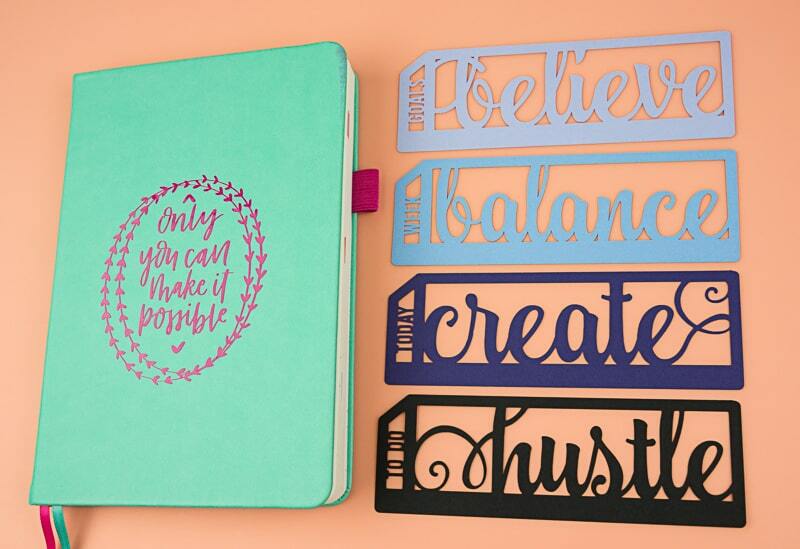 I took the liberty of jazzing mine up with my brand new Cricut Explore Air 2 cutting machine (I’ve gone a little Cricut crazy since I got this thing)! 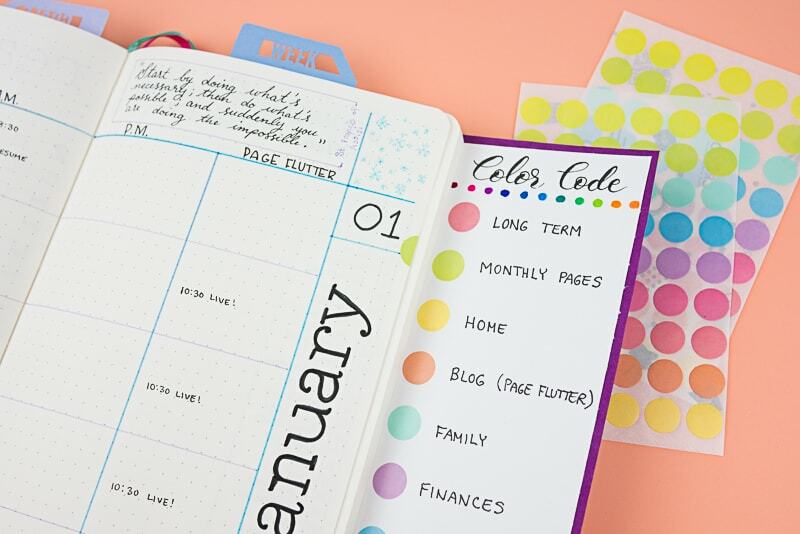 Some of my favorite bloggers just created a collection of cut files called the Fresh Cut Bundle (<<look under the section called “SVG Files”), so I used the files to make a vinyl decal and some cardstock bookmarks to to use in my journal. My journal comes with ribbon markers, but I never have enough ways to mark pages! Here’s a peek at my color code and index pages. The Scribbles That Matter notebook comes with these pages pre-printed. 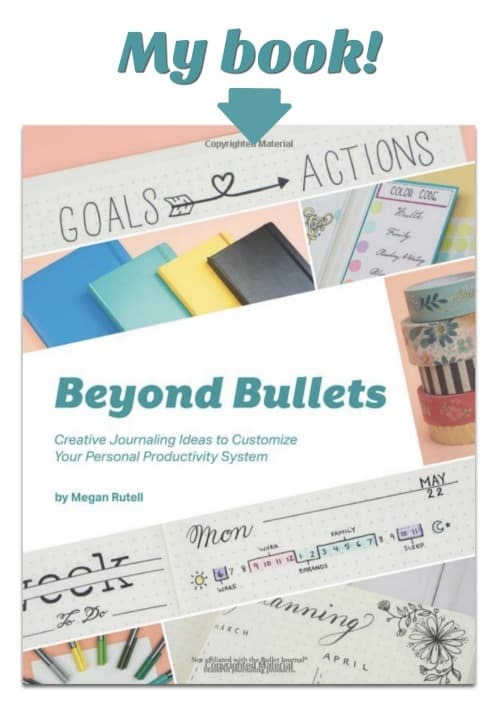 I didn’t define my bullets on this page, but my bullets are more or less the same as the Bullet Journal system. Feel free to play around with your own points and icons until you find one that works for you. In the past, my color codes weren’t especially clear. In my 2018 journal, I was careful to match my ink color code (in the front of my journal) with the color code on my flip out index card. If you want to know more about my edge index, check out the replay of my Planvember video where I show you how to make one. I always get questions about the labels I use for my edge index. You can use any colored labels you like. Most office supply stores carry basic round labels, but I prefer these smaller labels in pastel colors (if these aren’t available, try one of the other options here –>). You can also find beautiful colored stickers on Etsy, or even make your own with sticker paper and a cutting machine. 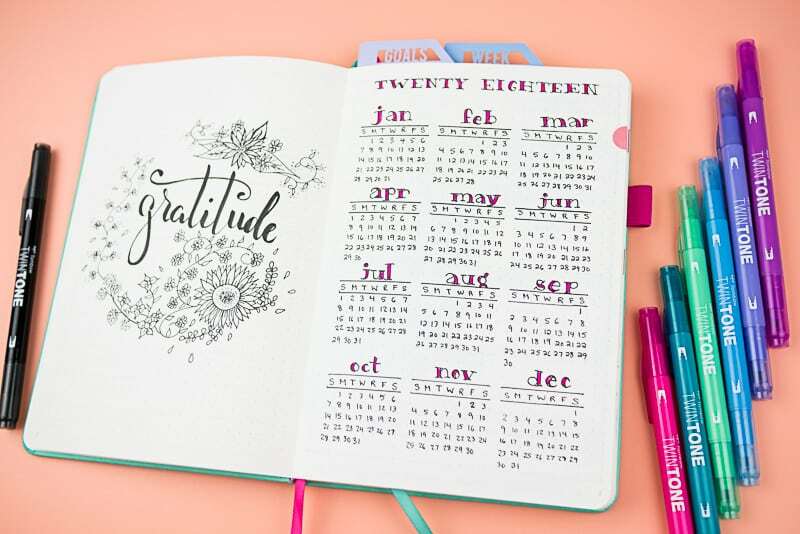 My word for 2018 is “gratitude.” I thought this was a nice way to set the tone for my journal and dress up my 2018 Year-at-a-Glance page. Most of the colors you’ll see in my journal are Tombow TwinTones (brights and pastels). If you looked back at my “Birthdays & Holidays” page from my 2017 journal, it would look very different from the one pictured here. This was a great way to try a new layout. I’ll use any excuse to bust out my helix and circle compass! During the live session, you guys had a really strong preference for this color wheel layout. I agree, it turned out beautifully! I colored mine with my Prismacolors, but there’s a printable black-and-white version in the Vault (if you don’t have a password to the Vault, you can subscribe below and a password will zip right over to your inbox). Next up, the all-important future planning pages! I like this simple Column Method because it’s so easy to use. I put 4 months on a 2-page spread, so there are 2 more spreads just like this one to accommodate the rest of the year. I don’t delude myself that my system will work well for everyone else in the world. 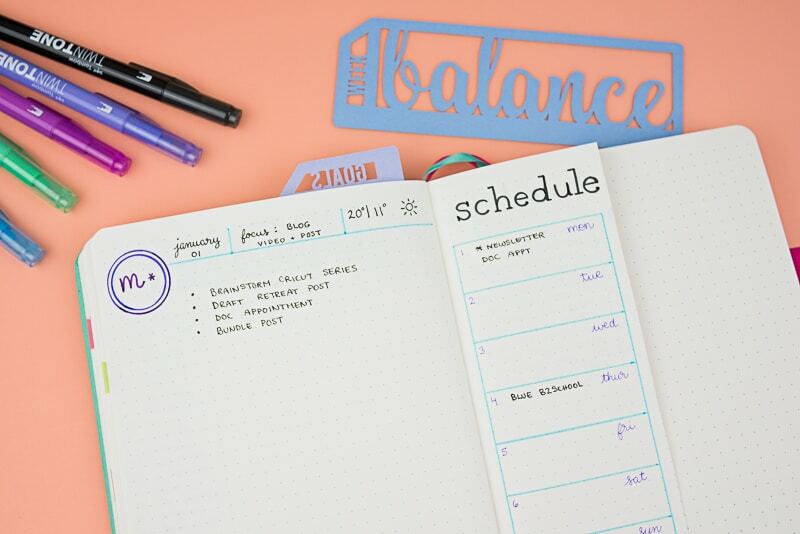 If this layout doesn’t meet your needs, feel free to browse for your perfect future planning layout in this post. I have to plan very far into the future sometimes. I don’t necessarily need detailed planning this far out, but as the end of the year approaches, I like having a page to catch long-term events. 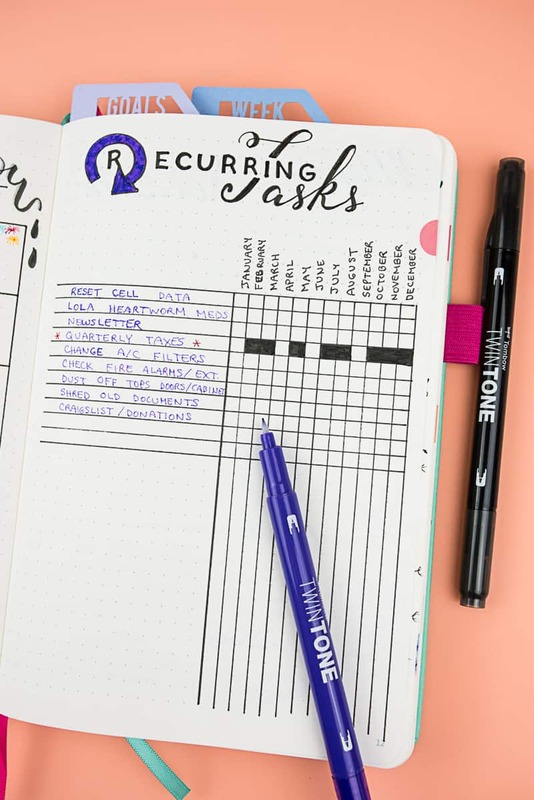 The Recurring Task Tracker was something I added to my journal last year, and I love it so much that I kept it. I’m not very good about habit trackers, but I find a monthly tracker is very easy for me to keep up with. I just give it a quick glance every time I set up my new monthly page. Speaking of creating monthly pages, I know migration (especially moving to new planning pages) can be scary for some people. 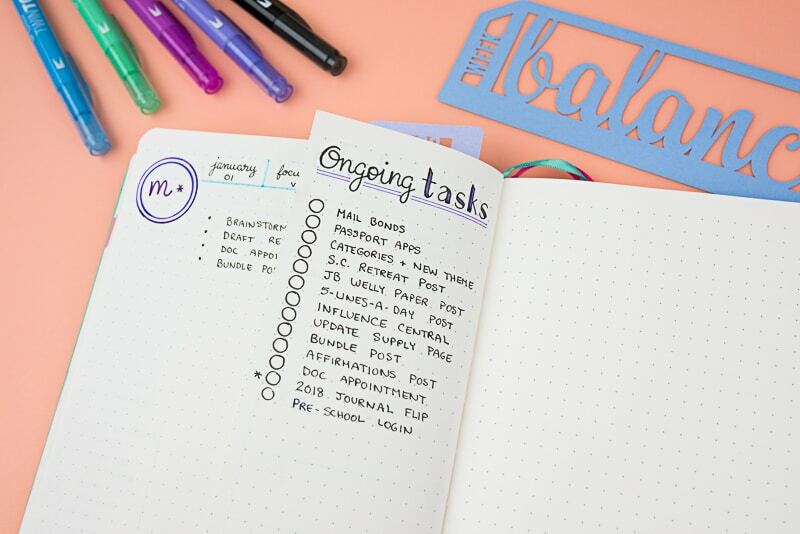 Whenever I move tasks from page to page, that’s when I’m most likely to lose something (Ugh! The dreaded lost bullets…). To combat this problem, I created a formal planning routine and a checklist that I can follow each month. 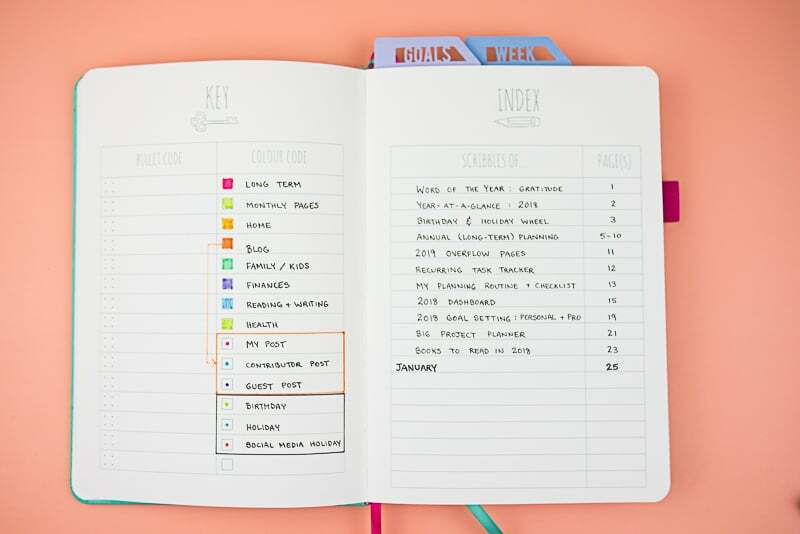 This way I know I won’t forget to check a planning page (you know, all those pretty pages we create with the best of intentions, then we promptly forget they exist). 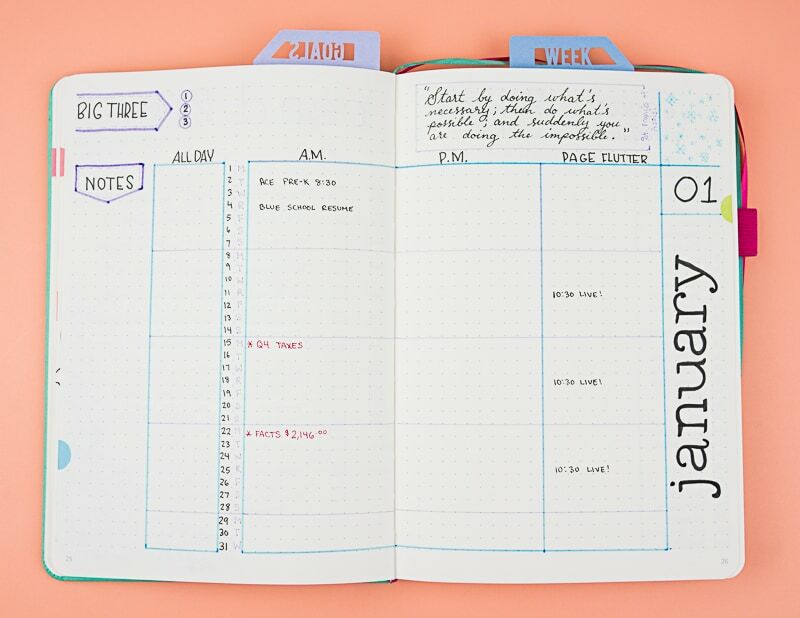 Now that my long-term planning pages are taken care of, it’s time to welcome the new year. I created these pages as a dashboard; they set the stage and welcome the new year. 2018 is the Year of the Dog, so I created some faux watercolor paw prints with my Tombow Galaxy brush pens. Next up are my goal-setting pages. 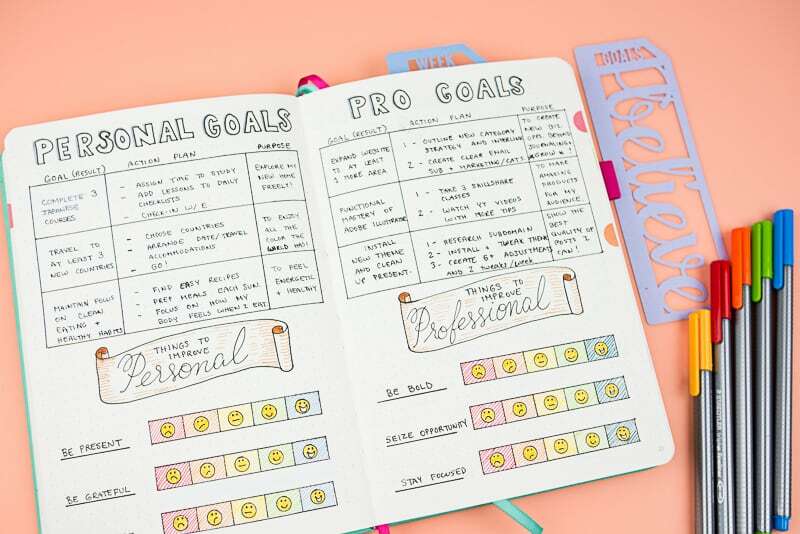 I created personal and professional goals. I meant to stop at only two goals, but I got carried away.I did have to grab my trusty Staedtler Triplus Fineliners for this page because my Tombow TwinTones didn’t have the colors I wanted. The top half of each page focuses on measurable goals. They’re classic SMART goals. The lower half of the page is an invention of my own. I always have a few things I want to work on that are less definable (be present, for example). I decided to give myself a 1-5 scale (frowny face to happy face), so I can grade myself on that scale. At the end of the year, I’ll re-grade myself to see how I did. It’s my simple method of self-assessment on things that are highly subjective. 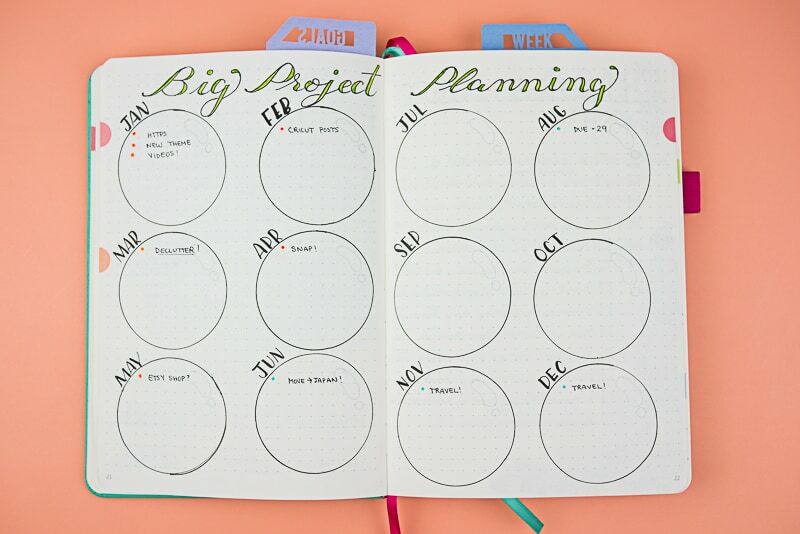 My big project planner is a bird’s-eye view of the major projects I’ll tackle throughout the year. By seeing my projects laid out in this way, I can ensure that I don’t cram too many things in one bubble. If you want to manage your stress levels while still chipping away at goals, you may find this page useful. For me, it’s also a good way to get a rough deadline on paper so I don’t let myself procrastinate too long. I don’t ordinarily stack many collections at the beginning of my journal (I just let them happen naturally wherever they’re needed). Books, on the other hand, deserve a special place. It was such a busy year in 2017 (between the blog, the book, a deployed husband, and 2 kiddos to chase) that I didn’t do nearly as much reading as I wanted to. 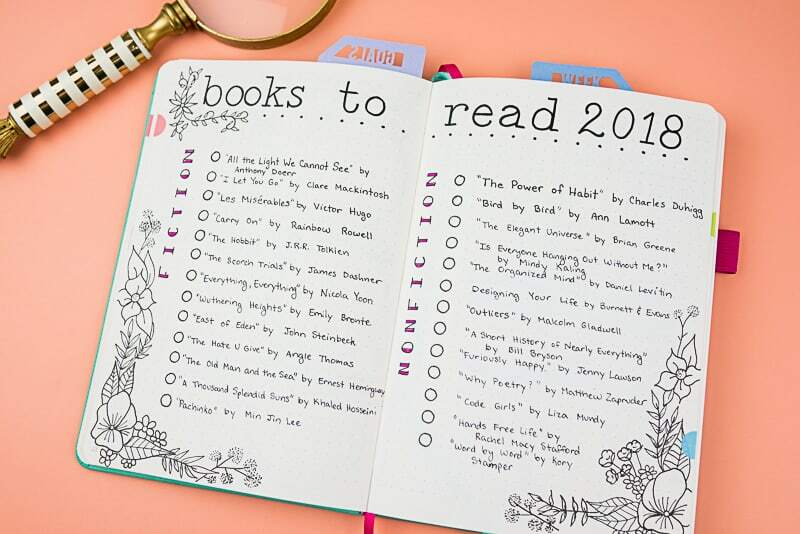 Reading is one of my favorite pastimes, so I intend to spend a lot more time between the pages in 2018. I split my list into fiction and nonfiction, and mixed in a few classics so I can seem smart at parties. I also kept my reading list on the short-is side. That way, I can pick up a new release that catches my eye! And just like that…We’re back at monthly pages. 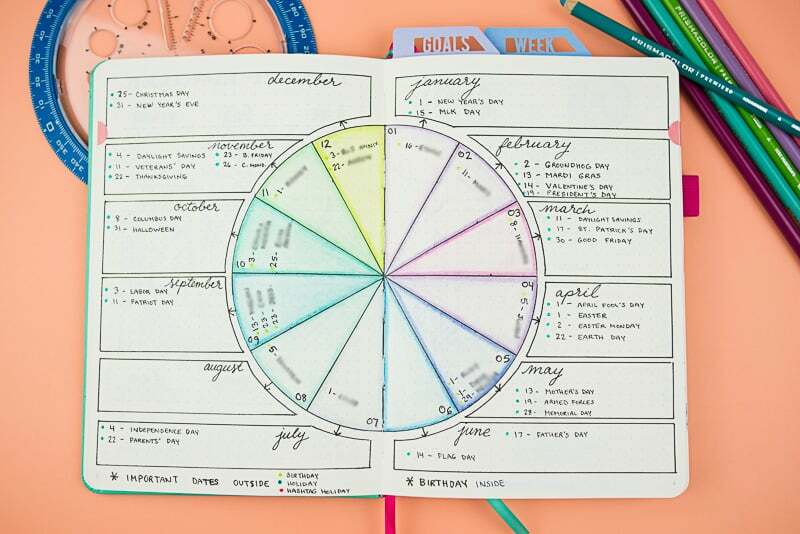 I tweaked one or two things in my monthly layout, but it’s mostly the same format I used in my 2017 journal. It’s been working well for me, so I don’t see the point in messing with it. 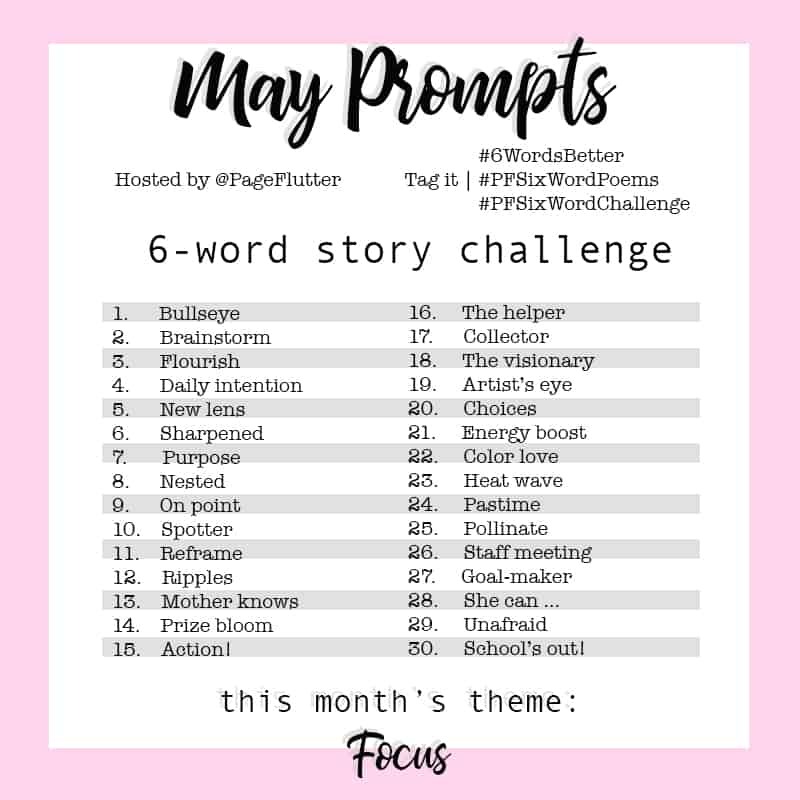 I run a 6-word story challenge on Instagram. This year’s challenge is called Year to a Better You: 6 Words at a Time. I included a page for the challenge prompts, along with a blank page where I can get creative and messy. Finally, it’s time for my weekly pages. I’ve recently changed my weekly layout to include a vertical Dutch door. I don’t know what to call this setup, but vertical Dutch door feels right. My schedule is always visible, and I still have two full pages for daily lists, as needed. The back of my schedule is a great place for my running task list (things from the week prior or other big tasks for the week). Nothing left to do but live! I can’t wait to fill the rest of these blank pages with everything 2018 has to offer. 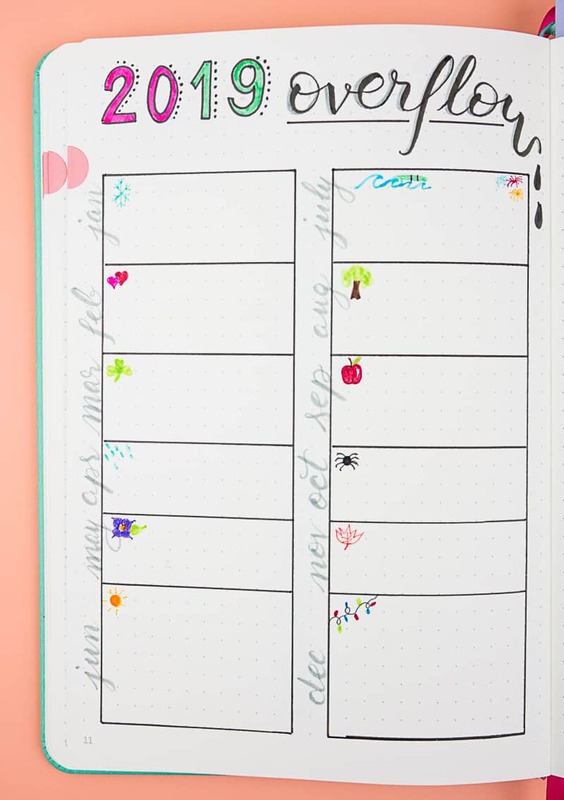 My favorite part about this creative style of planning is that I have room to change my mind, take notes, doodle, and reflect. Let’s do this, 2018! 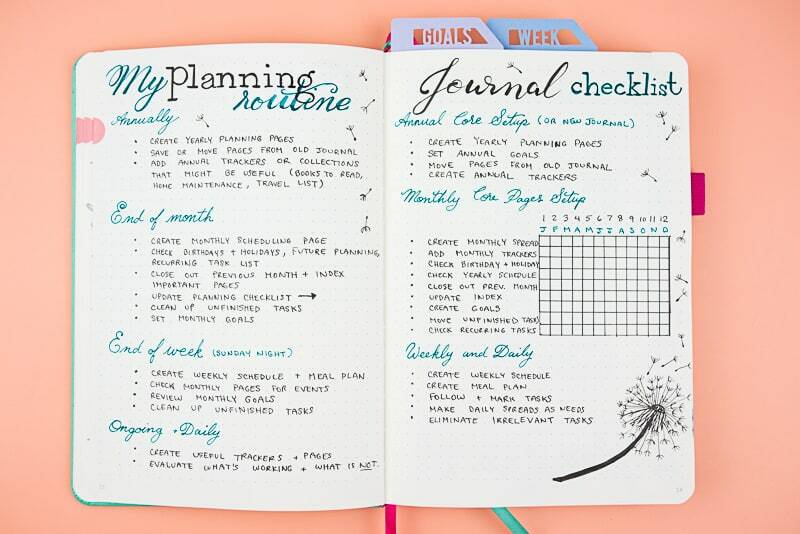 Is this your first year using a journal? 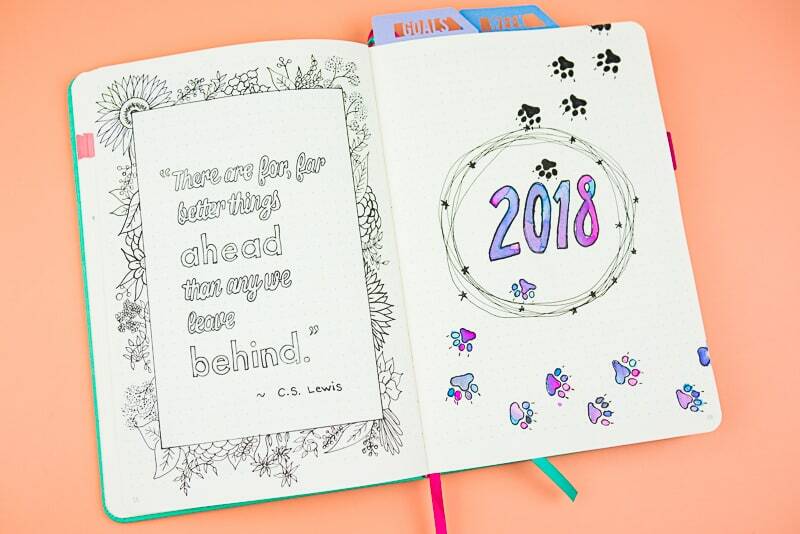 Whether you’re new or seasoned, I’d love to know which pages you’re using in your 2018 journal to make this your best year ever! Drop me a comment below. 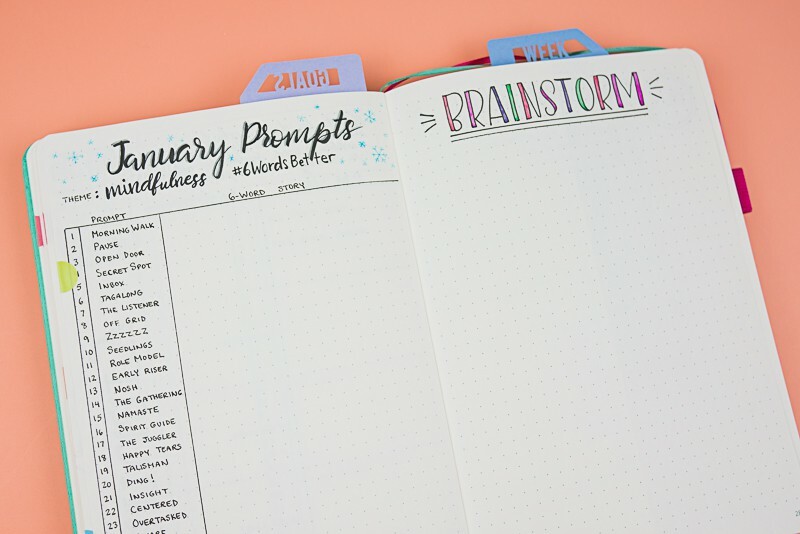 2018 will be my first year using a bullet journal and I am so happy I came across your blog! Such great, helpful tips and ideas! Thank you for sharing. You’re so welcome! I’m thrilled you dropped by. Let me know if you have any questions along the way! Brand spanking new to this bullet journal thing. 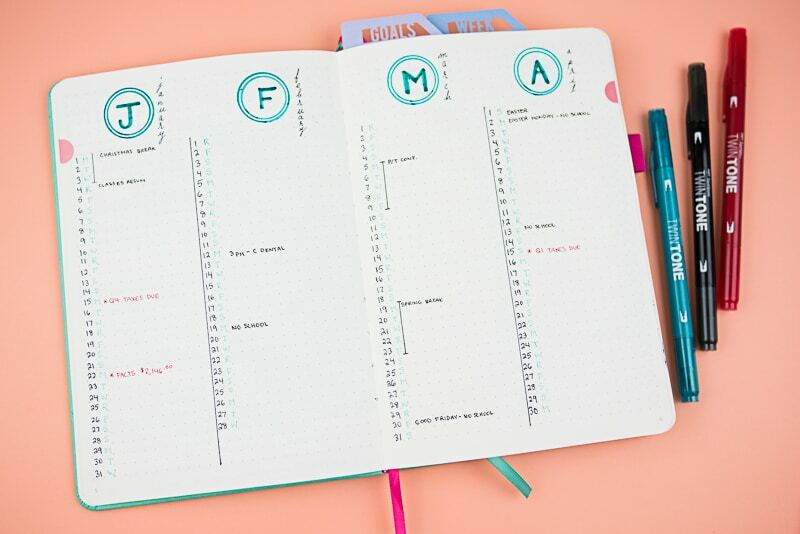 I’ve always struggled with “planners” and how to use them. I’m really excited to get going and today is actually the first day I’ve been entering things. I love your monthly spread and I think as a lefty it will be perfect for as the others I’ve seen have notes/goals on the right. I’m not super crafty and my handwriting is terrible but it’s a jumping off point for me to tap into the creative person I know is hiding in there! 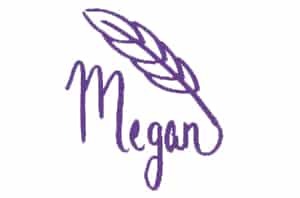 Love your page and blog! !